When I found out that Tropical Traditions had a great recipe for a coconut flour-based pizza crust, I had to give it a whirl. So I did. Unfortunately, my first experience with coconut flour pizza was kind of a bust, so the opportunity to redeem the dish was quite exciting. My fiance and I give this dish two thumbs up. It’s not Dominos, or Caesars or Round Table. So don’t be expecting classic gluten-pizza taste and texture. However, the crust is flavorful with herbs and garlic, it holds up under the weight of pesto and toppings, and the edges get crispy. 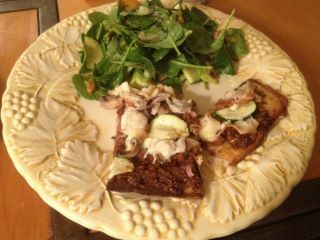 So I call that a success in the world of Paleo-Italian fusion cuisine. Beat eggs in a medium-sized bowl, mix in milk and garlic. Add remaining ingredients and beat into the milk mixture. 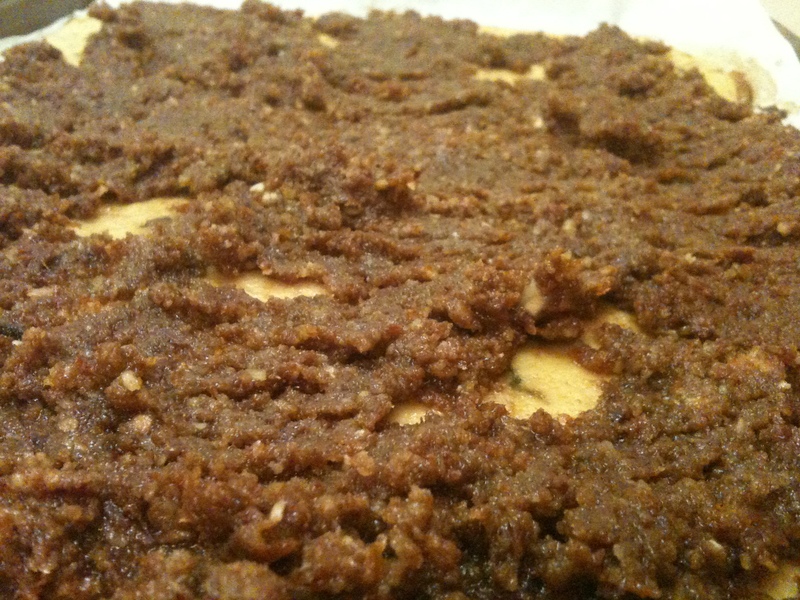 The batter needs to be thin enough to spread but not watery. Bake 12-20 mins. until bottom edges begin to brown. Cover with your sauce and toppings. Bake for 5 -10 mins depending on your topping choice. I made ours with a sun-dried tomato pesto. 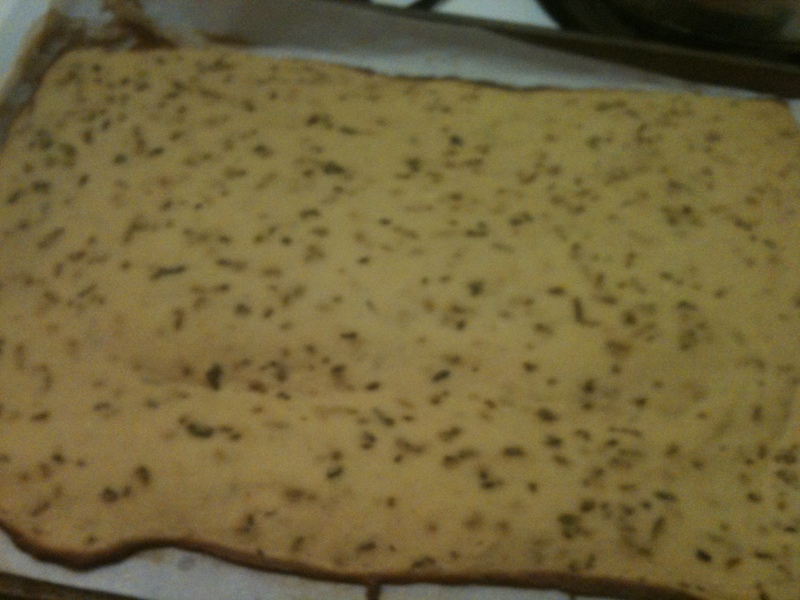 I think I like this type of crust with a sauce/spread like a pesto instead of a more watery pizza sauce. 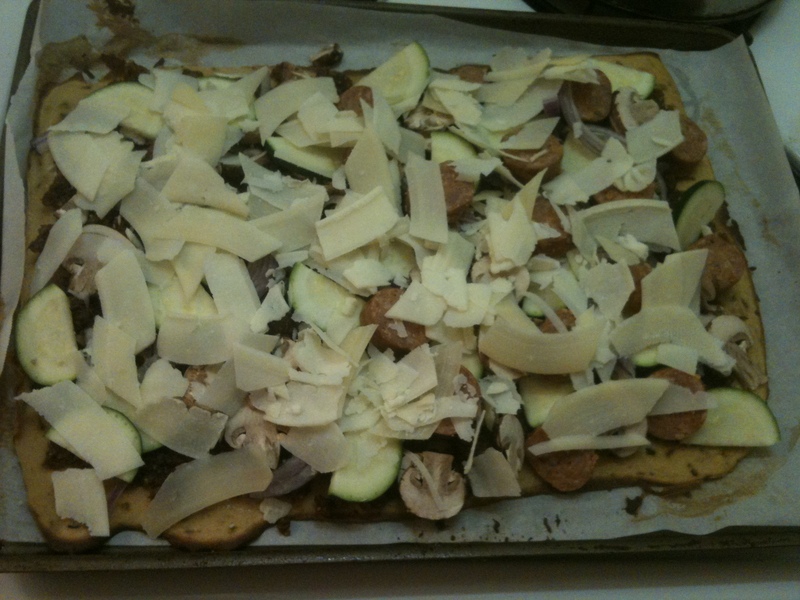 italian sausage, red onion, raw shaved parmesan, mushrooms, and zucchini. Yep… I recall that pizza… so delicious.